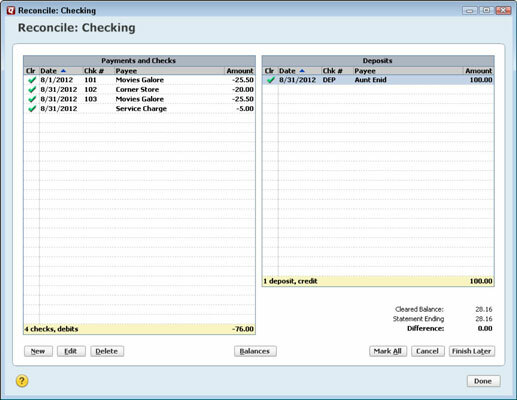 When balancing an account in Quicken 2012, you mark all the cleared checks and deposits. At this point, the difference between the cleared balance for the account and the bank statement’s ending balance should equal zero. If the difference does equal zero, you’re done. Just click the Done button to tell Quicken that you’re done. Quicken displays a congratulatory message telling you how proud it is of you, and then it asks whether you want to print a Reconciliation report. As part of the finishing-up process, Quicken changes all the cs to Rs. There’s no great magic in this transformation. Quicken makes the changes to identify the transactions that have already been reconciled. Can’t decide whether to print the Reconciliation report? Unless you’re a business bookkeeper or an accountant reconciling a bank account for someone else — your employer or a client, for example — you don’t need to print the Reconciliation report. If the difference doesn’t equal zero, you have a problem. 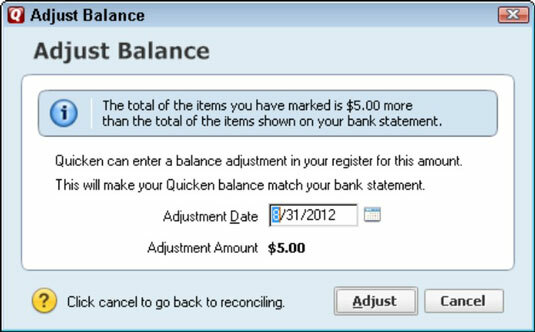 If you click Done, Quicken displays a message box that provides some cursory explanations as to why your account doesn’t balance and then, if you indicate you want to soldier on anyway, Quicken displays the Adjust Balance dialog box. This dialog box tells you, in effect, that you can force the two amounts to agree by clicking the Adjust button. Forcing the two amounts to agree isn’t a very good idea. To do so, Quicken adds a cleared and reconciled transaction equal to the difference. If you want to reconcile later without saving your unfinished work, click Cancel in the Reconcile: Checking window and then click Yes when Quicken asks you whether you really want to quit without saving your work. The next time you click the Reconcile button, you’ll have to start over from scratch. If you can’t get your account to reconcile but want to save your work, click the Finish Later button. Quicken leaves your reconciliation work basically half done. The transactions that you marked as cleared still show a c in the Clr field. And you still have an unexplainable difference between the bank statement and your register.